Some days I feel like I need to hurry up and hurry up. I just finished the last stitches on the first 4 blocks of Noah and Matilda and today all the February blocks for all the quilts I am making came out and I am already behind again. Noah and Matilda is the new BOM quilt from Dawn at Collector with a Needle. If I remember correctly this is the third quilt I have made from one of Dawn's patterns. 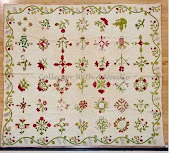 She alway does a wonderful job drafting the patterns. This one she is sending as a BOM. Four blocks each month for a small fee. The blocks finish at 8 inches and are set on point. I haven’t been doing much stitching the past few days as I have my 7 year old Granddaughter staying with me and that’s a different kind of fun. That is a fabulous kind of fun, a GD is a very special thing. I love how your blocks are finishing up. Very, very pretty!! Dawns patterns are beautiful. 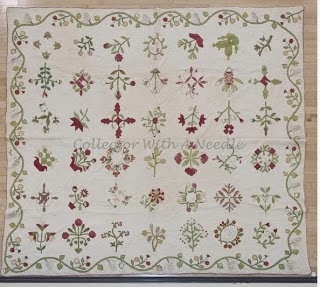 If I did applique they would certainly be on my bucket list. Your blocks look lovely, Nancy! Beautiful stitching Nancy - love the blocks! 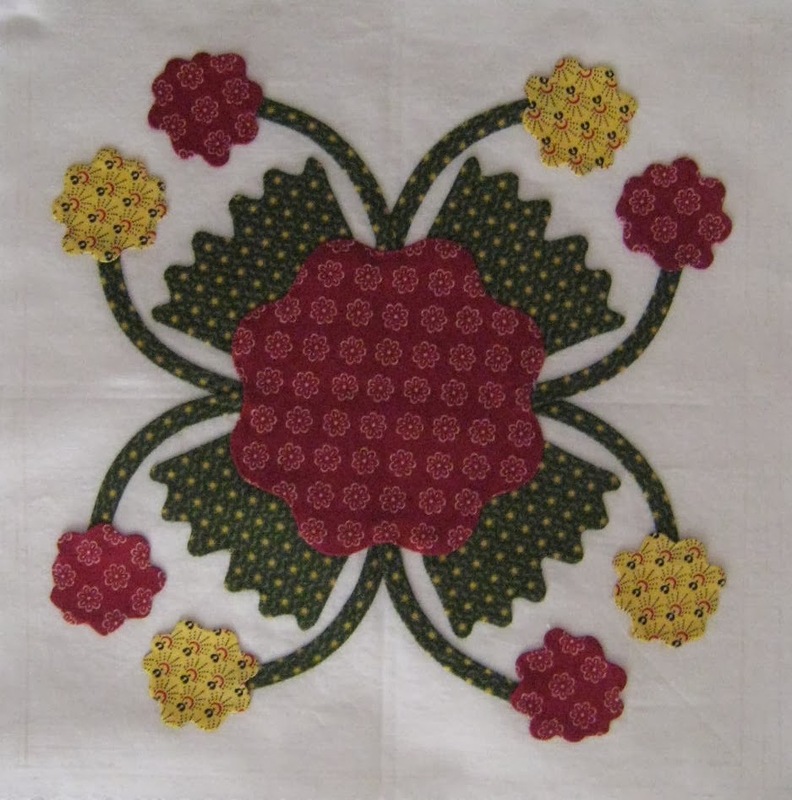 I especially love the last flower block with its spinning petals - such a nice combination of fabrics there. Beautiful blocks, Nancy. Keep having fun! Wow - those blocks are great. Wish I had time for all the wonderful BOMs out there. Have fun with your DGD. Wow, Nancy!I love your blocks! 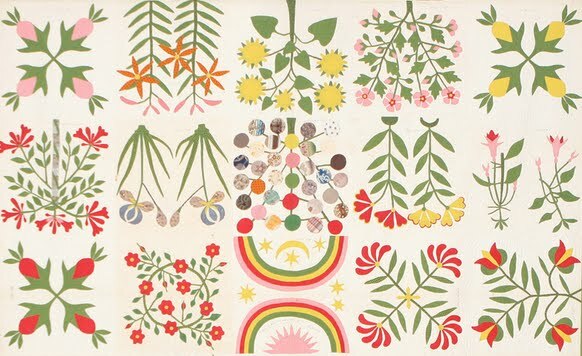 Great fabrics, especially for the petals i the flower. Have lots of fun with your granddaughter! I'm definitely admiring your blocks, Nancy. I've never undertaken such a project before. I've chosen my red and green and chrome fabrics with no problem, but I need advice for the background. What is your background fabric? I have a lot of fabric in my stash, but I don't think I have 8-1/2 yards of anything appropriate. We have no local quilt shop--but I'd be willing to travel a bit to get some. Or I can order something online. I'd appreciate your advice and/or suggestions. I don't want to put a lot of time into stitching if I use a stupid choice for background. BTW, I'm not an experienced hand appliquer. 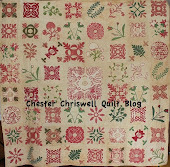 I'll probably be machine appliquing this quilt, or I'll never get it done. How About A Little Color - "Flower Pots"